Contact was lost with a Russian IL-76 fighting a blaze near the city of Irkutsk when it was at an altitude of 3,000 meters (9,900ft). The emergencies ministry plans to parachute in 100 rescue workers to search for the missing plane and the 10 people on board. “Contact was lost in the Kachug area of the Irkutsk Region, where smoke from forest fires was extremely thick,” RIA Novosti reports, citing a source within the emergencies ministry. A large search operation has been launched to find the missing plane, with nearly 450 people involved in the rescue effort. “All in all the search-and-rescue operation involves 441 people and 28 units of equipment, including 16 aircraft,” an official told RIA Novosti. According to the local administration, the search is being conducted by planes because the territory is too large and inaccessible for a ground search and there are no roads in the area. “The crew of the aircraft has extensive experience in firefighting, delivering humanitarian aid, and rescue operations,” a source told TASS news agency. 8 aircraft are involved in rescue op, says emergencies ministry press service. 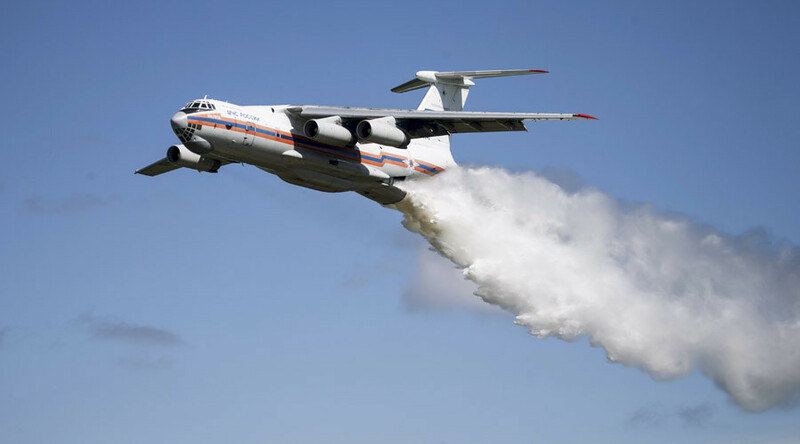 Russia’s IL-76, nicknamed the “water bomber,” is the world’s largest firefighting aircraft. It is capable of dumping 42 tons of water at a time.